Team morale is a key part to the success of any team. It’s been proven time and again that success rises when individuals play as a group, rather than a group that plays as individuals. Sure, talent doesn’t hurt, but to win over your brothers in the dressing room it takes more than that. Likability, respect, inspiration, and leading by example – these are just a few of the qualities that have belonged to the Rangers’ Most Popular Player. Joseph’s work ethic and positive attitude over the past four seasons, has earned him a new level of respect throughout the Rangers organization. Garreffa has contributed both on and off the ice and has been a leader on this team. His approachability and experience have made him into someone many rookies look to for motivation and advice. The Jim Malleck Memorial Trophy for Most Valuable Player is named after former Director and Past President through the 1960’s and into the 1970’s, Jim Malleck. Awarded for the first time following the 1985-86 season, the Most Valuable Player award is one of the greatest honours to be bestowed upon a player. It is awarded to the player deemed to have the most profound impact on the team’s success. This season, Riley only went 15 games out 58 played without a point. He tallied 30 goals, 55 assists for a total of 85 points—a career high in all three categories. In his 58 outings, he had 23 multi-point games for an average of 1.47 PTS/G. 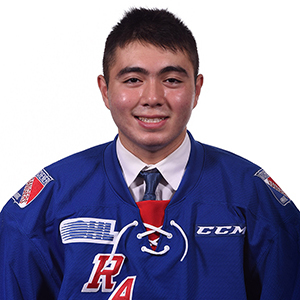 Riley was also named the OHL’s On the Run Player of the Week for the regular season week ending February 3rd with nine points in three games and a plus-minus rating of +8. This season, Greg only went 14 games out of 68 games played without a point. Last season, he played more of a shutdown role, totaling 30 points (13 goals, 17 assists), this year he has a career high in points with 97 (36 goals, 61 assists). 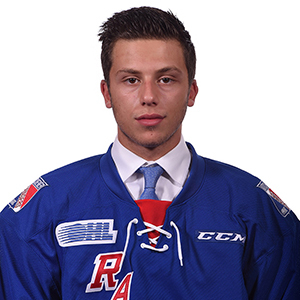 Meireles was named the OHL’s On the Run Player of the week and the CHL Player of the Week for the regular season week ending March 10th after recording nine points in three games. Jim Reilly. First awarded in the team’s inaugural season in 1963-64, the award has been won by 41 different players. Dwight Foster’s mark of 143 points in the 1976-77 season remains a franchise high for points in a season by a Rangers player. Greg has tripled his 2017-18 point total, finishing the year with 36 goals, 61 assists for a total of 97 points in 68 games played—a PTS/G average of 1.43. Missing no regular season games, he is in this season’s top 10 OHL scoring leaders. He finished off the regular season, on a 20-game point streak tallying 38 points. He registered multi-point games 30 times, 10 with three points or more. The Ted Scharf Humanitarian Award, sponsored by the Kitchener Sports Association, follows the KSA motto of “TRUE SPORTSMEN MAKE GOOD CITIZENS.” This award is in recognition of the Rangers player who contributed most to our community during the regular season. The award is named after alumnus and former Rangers President Ted Scharf, a leader himself in community efforts and involvement. The Herchenrader Family Trophy for Best Defensive Ability was donated by former Director Alf Herchenrader and his family. As the old saying goes, defence wins championships. Certainly without it, it makes the road to winning a lot more difficult. Whether it be a quarterback on the power play, or a speedy sniper who jumps into the rush, a well-rounded blueliner is a focal point to the success of any club. Kyle’s defensive instincts have blossomed since his Ontario Hockey League debut in 2016-17 as a free agent. Kyle’s shutdown defensive style has earned the respect and trust of the coaching staff, to be relied on in crucial situations. The overager is looked up to by younger blueliners for his effort and knowledge both on and off the ice. The award is named after Rangers’ former longtime assistant trainer Bob ‘Snowy’ Schlieman. An offensive defenceman can be a game changer for a team, providing secondary scoring from the back-end, or seamlessly jumping into the rush and confusing the opposition. Since first presented in 1991-92, 18 Rangers have earned the award. Donovan had a breakout second half of his rookie season, both on the scoreboard and in his play. He tallied eight points in the first half followed by six goals, 12 assists for a total of 18 points in the second half of the season. In 62 regular seasons games played Donovan recorded 26 points. He registered his first multi-goal game on March 1st in London, scoring twice. Donovan leads all Rangers defencemen in goals with seven. The adjustment to the Ontario Hockey League from whichever league you played in before coming here is rarely an easy one. The Michael Pappert Memorial Trophy, named after a former Rangers Director from the 1960’s, acknowledges the efforts, accomplishments and great strides made by one of the Rangers rookies during the past season. Donovan’s style of play, makes it impossible for any fan or scout to look away. His strength on the puck mixed with his offensive ability, makes him an impactful force on the Rangers blueline. 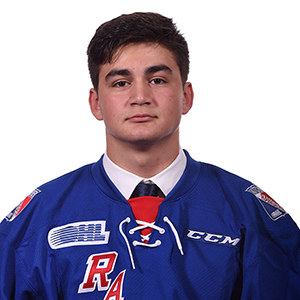 The 17-year-old rookie was selected as one of the 57 CHL players to represent Canada in the 2018 Under-17 Hockey Challenge in New Brunswick this November. Each time a Rangers player is chosen as 1st, 2nd or 3rd Star in a game, points are given to the player and accumulated at the end of the regular season; three points for 1st, two for 2nd and one for 3rd. The player with the most points earns the 570 News 3-Star Award. Riley was named the 570 News 2 Star Award winner after being named a star 14 times in 2018-19; 10 times 1st, two time 2nd, and two times 3rd for a total of 36 points. The Jim McGeachie Memorial Trophy is named in honour of former left winger Jim McGeachie, who passed away suddenly in a car accident in the summer of 1980 at the age of 19 while a member of the Rangers. The winner of this award exhibits outstanding effort, spirit and commitment to being a member of the Rangers. He exhibits competitiveness, as well as dedication to the game and to his teammates. Any player who is awarded the Jim McGeachie Memorial Award for Outstanding Team Effort might go through a tougher vetting process than a winner of any other award, based on the big shoes there are to fill from the previous winners. Riley is only the sixth Rangers player in franchise history to win this award for two consecutive years. This season, Riley has made a conscious effort to improve his on-ice ability as well as in a leadership role on this team. 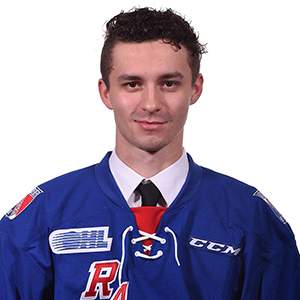 He has personified what it means to be a member of the Kitchener Rangers. This season, Greg’s work ethic both on and off the ice is second to none. He treats every shift as if it was his last and leaves every last bit of effort out on the ice for his teammates. His fellow blueshirts look to him as a player who they would like to model their game after. 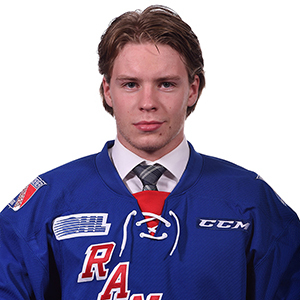 Greg truly exemplifies what it means to play for his teammates and the Kitchener Rangers organization. Our next award is presented to the player who best embodies sportsmanship and respect for the game in true Rangers fashion. 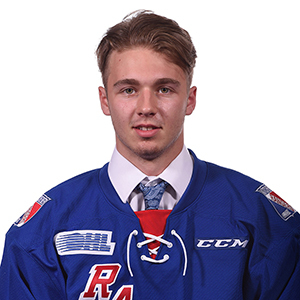 On February 21st, 2019 in Niagara, Joseph played in his 200th consecutive OHL game. Also this season, Joe tallied his 200th career OHL point and is still counting. In 68 games played, Joe registered just two penalty minutes. Rickard is only the fifth player in franchise history to receive this award for two consecutive seasons. Rickard was also named the 2018-19 Team Captain and has played an important role on this team. In 62 contests, Rickard registered just four penalty minutes—one two-minute minor in October and one in March. The Les Bradley Memorial Award is named after longtime Rangers trainer Les Bradley. Bradley was a mainstay on the bench from 1969-1986, then after retiring as the team trainer, spent more than 15 years as a team ambassador in the press room. To be named the most improved player on a team truly is a great honour. It’s a testament to a player’s ability to learn, grow and improve his game, and the games of his teammates. For Jonathan, it meant setting new career highs in goals (50), assists (23) and points (73). Jonathan only registered five goals and seven assists for a total of 12 points during the 2017-18 season. Luke backstopped the Rangers in four 2019 playoff games. He faced 141 shots and made 123 saves. Though the playoffs didn’t go as hoped, Luke kept us in every game and gave us the chance to win. His effort and resilience didn’t go unnoticed. This season, Luke was acknowledged by the league twice, as the OHL’s goaltender of the month and the CHL’s goaltender of the week. The Don Cameron Award is awarded to a Rangers player who reaches the 50-goal milestone during the regular season. It was presented for the first time in 1975-76, and has been presented 11 times to ten different players. The 50-goal mark was reached four other times, prior to the award coming into existence. The last time the Don Cameron Award was presented to a Rangers player was to Jeff Skinner (50) in 2009-10. Jonathan is the 15th player in Rangers history to reach the 50 goal milestone! Last accomplished by Jeff Skinner in the 2009-10 season. 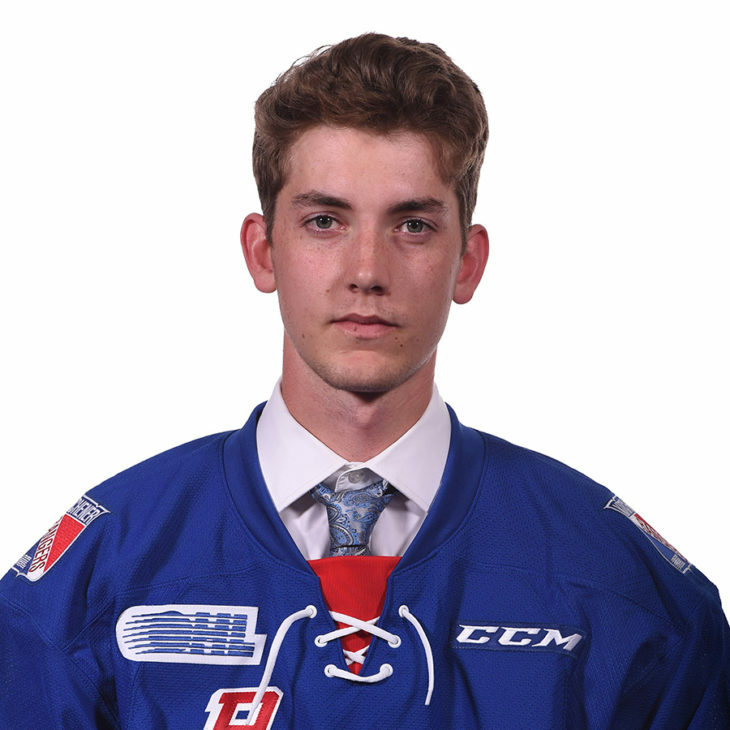 Jonathan was undrafted in the OHL and brought on as a Free Agent in the 2016 season. With hard work, persistence and patience, Jonathan reached the 50-goal milestone. Last season Jonathan had a total of five goals, seven assists for a total of 12 points. Four times a season, the Rangers present a deserving player with the Robin’s Goldsmithing Academic Achievement Award. This award acknowledges a players drive to educational betterment and his efforts in the classroom. Three times a season, the Rangers present a deserving player with the Channer’s Mens Apparel Outstanding Player Award. This award acknowledges a player who encompasses strong play on the ice, gives back to our community, and aims to better himself with education. 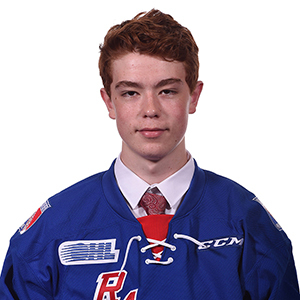 The Harold Gowing Memorial Award was presented to the Rangers player who previously played as a youth in the Kitchener Minor Hockey Association (KMHA) and showed the most improvement. It was first awarded in 1967-68 and was earned 33 times. The award is no longer in circulation and was last presented to Jacob Cascagnette following the 2014-15 season.